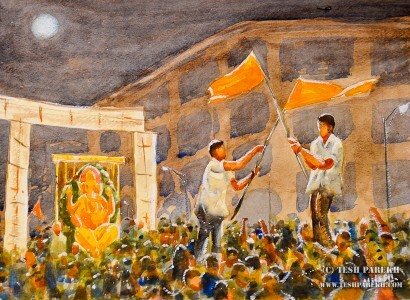 My latest watercolor paintings from recent trip to Mumbai. I was visiting my family for ten days. I went to Mumbai after nine long years! Much has changed there while some of the things have remained the same. The travel was long! Almost twenty-four hours from my home in US to my family’s home in Mumbai. Each way. The North Carolina weather was pleasant when I left. Mumbai weather? Hot! And humid Even for the locals! I sketched and painted almost everyday. I had to travel light so could only carry bare minimum supplies. Painting in humidity was a challenge. 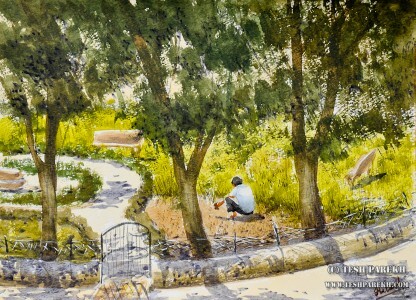 But, that is the fun of painting in watercolors. You learn something new with each painting. I may have learned a thing or two about myself during this trip. 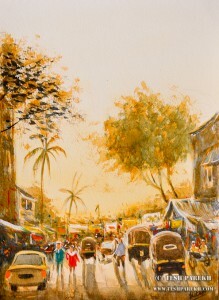 “Mumbai Street Scene”. 12×9. Watercolor on paper. By Tesh Parekh. Suburban street scene. Can’t miss those auto rickshaws! I loved the golden evening light. “The Gardner”. 9×12. Watercolor on paper. By Tesh Parekh. This is the view from my family’s home. I painted this from life. I made reference pencil sketches of the gardener since he moved a lot. So, this little garden was full of tall grass and weeds. And the gardener cleared it little by little each day. Without using any tools. “The Lord Ganesha Immersion Night”. 9×12. Watercolor on paper. By Tesh Parekh. I had gone out for dinner with my family and on the way home saw this procession. I loved the energy of this celebration. 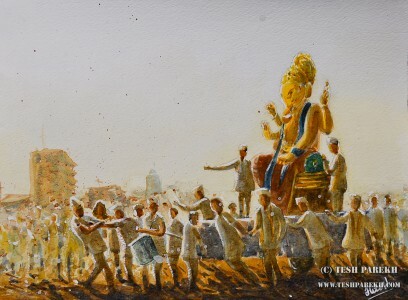 “The Lord Ganesha Immersion Procession”. 9×12. Watercolor on paper. By Tesh Parekh. The celebrations are all day and night. It is quite an experience. 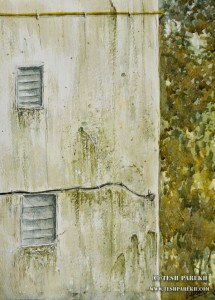 “Weathered Mumbai Wall”. 12×9. Watercolor on paper. By Tesh Parekh. Another view from my family’s home. Mumbai wall. Weathered by many hot summers and monsoons.